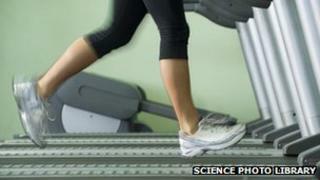 Up to a quarter of a million pounds of public money will be spent on improving a gym used by MPs and peers. The upgrade includes a new "spinning" area where members can train on static cycles, better showers, creating a towel store and a reception renovation. The work is expected to cost between £200,000 and £250,000, Parliament's authorities said. In 2010 the ventilation system of the wider basement area, including the gym, was revamped at a cost of £247,500. The Works to Westminster Gym, which is only open to parliamentary passholders, will receive a makeover, with new fittings including display cases, pin boards, shelving and a desk. The gym, in the basement of Parliament's Derby Gate building, has an exercise studio named after former Commons Speaker Betty Boothroyd. Income and profits are generated from fees paid by its 693 members, with the most expensive option costing £47 a month. The Commons receives a share of the profits made from running the gym, which it says it uses for upgrading or replacing gym equipment. A House of Commons spokesman said: "Parliament, through the Houses of Parliament safety, health and wellbeing service, facilitates the provision of the staff gym as part of developing a healthy working environment and encouraging people to have a positive attitude to health at work. "The gym is open to all at parliament and used by staff, and MPs and their staff. There will be a fair and open competition to tender for the refurbishment of this heavily used area of the parliamentary estate, including carrying out essential works to eliminate a problem with dampness in what is a grade two star listed building."